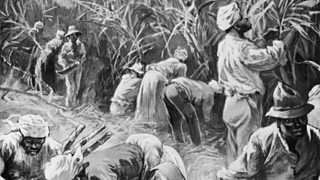 In the 17th and 18th centuries slaves were moved from Africa to the West Indies to work on sugar plantations. This industry and the slave trade made British ports and merchants involved very wealthy. The first colonies of the British Empire were founded in North America (Virginia, 1607) and the West Indies (Barbados, 1625). In 1655 Jamaica was secured. British slave traders started supplying African slaves to the British colonies to work on plantations. Britain‘s involvement in the slave trade developed further in 1713, when the Treaty of Utrecht granted British slave traders the contract, known as the Asiento, to trade 144,000 slaves a year to Spanish South America. After 1700, the numbers of slaves being transported increased greatly. Around six million Africans were taken as slaves to the Americas, at least one third of them in British ships. It has been estimated that overall, about 12 million Africans were captured to be taken to the Americas as slaves. The developing slave-based industries made Britain rich and prosperous. In the 17th century sugar cane was brought to British West Indies from Brazil. At that time most local farmers were growing cotton and tobacco. However, strong competition from the North American colonies meant that prices in these crops were falling. The owners of the large Caribbean plantations decided to switch to growing sugar cane. The plantation owners purchased slaves to provide the labour for this work. The sugar cane plant was the main crop produced on the numerous plantations throughout the Caribbean during the 18th and 19th centuries. These plantations produced 80–90 per cent of the sugar consumed in Western Europe. Almost every island was covered with sugar plantations and mills for refining the cane for its sweet properties. Until the abolition of slavery, the main source of labour was African slaves. Between 1700 and 1709 the trade in sugar increased dramatically due to the increasing popularity of sugar to sweeten luxury drinks such as tea and coffee. In 1700, Britain's sugar consumption was 4 pounds (weight) per person, a century later that had risen to 18 pounds per person. The increased availability and popularity of sugar was due to a gradual increase in the standard of living (whereas before only the very rich could afford such luxuries as sugar) and the discovery of more New World colonies which were ideally suited to the growing of luxury crops such as sugar. Although sugar was the most important crop in the Caribbean, other crops such as coffee, indigo and rice were also grown. Sugar production was labour intensive. The increased demand led Europeans to forcibly transport Africans as slaves. In 1746, economist Malachi Postlethwaite wrote, "If we have no Negroes, we can have no sugar, tobacco, rum etc. Consequently the public revenue, arising from the importation of plantation produce, will be wiped out. And hundreds of thousands of Britons making goods for the triangular trade will lose their jobs and go a begging". Many agreed with him, believing that the slave-based plantation system was vital to British wealth, industry and jobs. By 1750, sugar surpassed grain as the most valuable commodity in European trade - it made up a fifth of all European imports. The sugar market went through a series of booms. The rise in demand and production of sugar resulted from a major change in the eating habits of many Europeans. They began consuming jams, sweets, tea, coffee, cocoa and other sweetened foods in much greater volumes. Taking advantage of this growing demand for sugar, the Caribbean islands set about increasing production. In Barbados, sugar amounted to 93 per cent of the island’s exports.